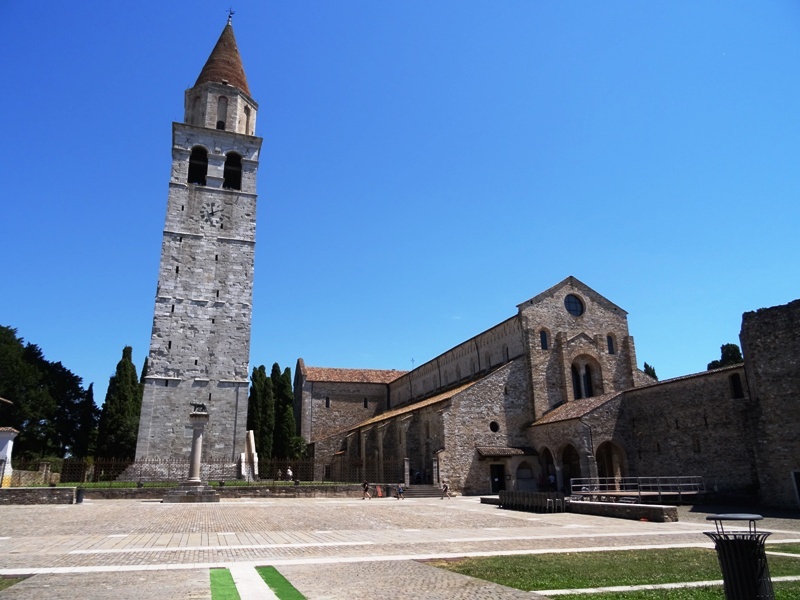 The beautiful Romanesque basilica of Santa Maria Assunta was the official seat of the Patriarch of Aquileia until the patriarchate was finally suppressed in 1751. The basilica we see today was erected in the eleventh century, but there has been a church at this site since the early fourth century, when Aquileia was a large and important city within the Roman Empire. The Santa Maria Assunta is certainly the highlight of any visit to the town, if only because of its exquisite original fourth century floor mosaics. Note that while access to the basilica is free, you have to buy tickets for visits to the crypts (which offer more mosaics and frescoes), the baptistery and the freestanding campanile. It is possible to buy a so-called Unico ticket, which also gives access to Aquileia’s interesting archaeological museum. Wikimedia Commons has a ton of pictures of the church and its treasures. (photo: YukioSanjo, CC BY-SA 3.0 license). 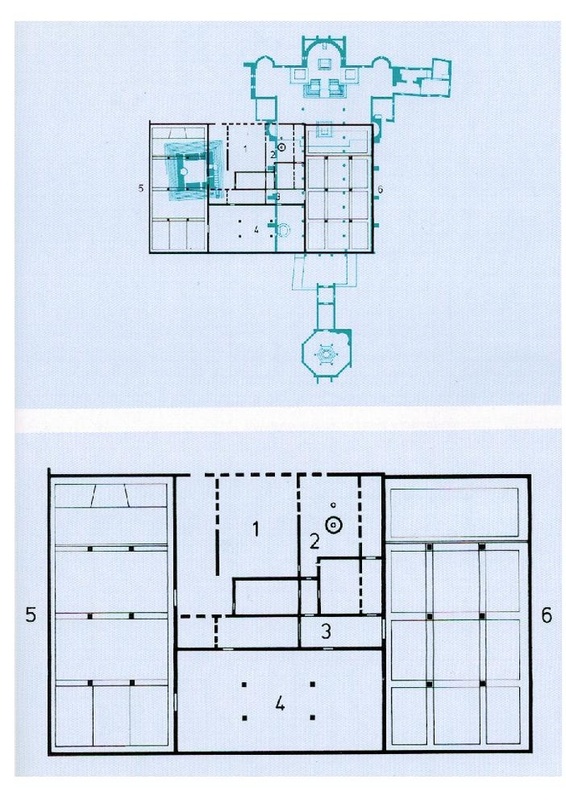 Plan of the ancient basilica (in black) and the current basilica (in blue). The original church did not look anything like a classical apsed Roman basilica. It was composed of two large rectangular halls without apses, one in the south and one in the north, with the southern one having a slightly wider nave. These halls were separated by another, transverse hall, as well as an atrium, a baptistery and what is considered to be a dressing room. The map included in this post gives a good idea of the church structure. Even better is this movie on YouTube which provides an excellent 3D reconstruction of the first basilica on this site (things start to get interesting around 0:20). The church seems to have been built in Aquileia’s trading area, and directly to the south of the church was a huge building which has been identified as a horreum, i.e. a warehouse or granary. It is quite plausible that the large halls already existed in some form and were used for commercial activities; perhaps they were smaller warehouses. Theodorus may have simply merged them and converted the complex into a church, which explains the slightly unusual form of the “basilica” and the fact that the two halls are not of the same size. Either the northern or the southern hall was used for religious services, but we do not know which one. The northern hall seems to be the most likely location, as it was this hall that was enlarged during the episcopate of Fortunatianus (ca. 342-369?). This bishop also built an atrium in front of the enlarged basilica, which is now long gone. Bishop Chromatius (ca. 388-407) enlarged the southern hall, adding the part that is now known as the The Chromatius Hall or Südhalle. Chromatius constructed the present baptistery of the complex as well. This phase of the basilica’s history is, however, not entirely clear. It is also possible that the extension of the southern hall was only begun after Aquileia had been sacked by the Huns, and that Chromatius had nothing to do with the project. In the ninth century, the buildings from Late Antiquity were restored and restructured by the patriarch Maxentius (ca. 811-833?). Maxentius added a semi-circular apse to the southern hall (not visible on the outside), built the portico that is still part of the present church and also constructed the crypt where the basilica’s relics are kept. The current Santa Maria Assunta is the work of Poppo, Patriarch of Aquileia from 1019 until his death in 1042 (or 1044 or 1045, depending on the source). Poppo was quite a character. “History affords no more perfect example of that phenomenon so characteristic of the Middle Ages – the worldly, ambitious warrior-priest”, wrote noted historian John Julius Norwich. He soon got into conflict with Orso, the Patriarch of Grado, who also happened to be brother to the Doge of Venice and who was responsible for the splendid cathedral on the island of Torcello in the Venetian lagoon. The conflict between the Patriarchates of Aquileia and Grado was four centuries old at the time, and Poppo saw Orso as a fraud who had usurped territory that was part of his see. In the 1020s, the fierce warrior-priest even invaded Grado, allegedly sacked churches and monasteries and carried off their treasures to Aquileia. The patriarch attacked Grado a second time in the 1040s, but died soon after launching this second campaign. 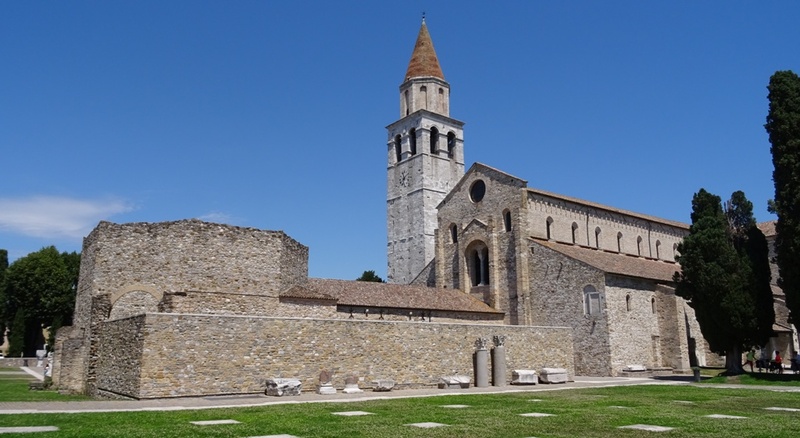 Although he had been a warrior all his life, his greatest deed was arguable of a religious nature: the reconstruction of the great basilica of Aquileia, which he consecrated in 1031. It is this basilica that we can admire today. Poppo also built the beautiful campanile, which was raised to its current height of some 73 metres in the fourteenth century. The view from the tower is beautiful: lush green fields and the Alps in the distance. It is even possible to see the lagoon. Poppo’s basilica, including – in the foreground – the baptistery and the Chromatius Hall. Poppo’s basilica has stood the test of time, although some more changes were made and restorations were carried out in the next few centuries. Patriarch Ulrich II (1161-1181) was probably responsible for the beautiful twelfth century frescoes in the crypt, while Patriarch Marquard of Randeck (1365-1381) restored the basilica from the pointed arches to the roof. The brilliant wooden roof itself, in the shape of a ship’s hull, was the result of a fifteenth century renovation. Santa Maria Assunta’s floor mosaics cover a surface of some 760 square metres. Together they make up one of the largest mosaics in the Western World. These include the mosaics that can be admired in the so-called Crypt of Excavations (Crypta degli Scavi). This crypt, which can be found at the beginning of the left aisle, gives access to parts of the transverse hall and northern hall mentioned above. Most of the campanile was actually built on top of this latter hall. Some of the mosaics down here predate the basilica. Especially wonderful are the images of several birds and other animals, as well as the mosaic depicting the battle between a rooster and a turtle. There are more mosaics in the Chromatius Hall, the best of which is arguably that of a peacock. But the mosaics inside the basilica itself remain the undisputed highlight of the Santa Maria Assunta. These mosaics are about a metre below the current floor level. In Poppo’s days, they were covered by a new red and white tiled floor and only rediscovered when that floor was removed between 1909 and 1912. When inspecting the mosaics, one has to conclude that they were unfortunately somewhat damaged by the insertion of brick supporting bases for the columns. We see portraits of benefactors (i.e. 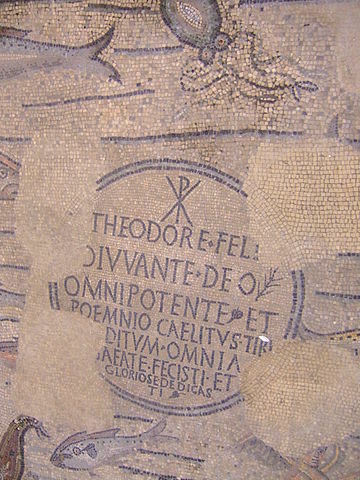 people who gave money so that the mosaics could be laid), several motifs including Solomon’s knots, and animals such as fish and deer. Also present are the Good Shepherd with two of his sheep and a flute, and an image of winged Victory. None of these mosaics are overtly Christian. The early Christians had no clear imagery of their own yet and simply borrowed images from Greco-Roman art. Pagan shepherds from bucolic scenes came to represent Christ the Good Shepherd, while the pagan goddess Victoria became a winged angel. Jonah swallowed by a sea monster (photo: YukioSanjo, CC BY-SA 3.0 license). Of course, the scenes showing the prophet Jonah are Christian. The Book of Jonah, part of the Old Testament, relates how Jonah had been ordered by God to travel to the pagan Assyrian city of Nineveh to prophesy. The prophet refused and instead took a ship to Tarshish – perhaps Tarsus in Cilicia – which was caught in a violent storm. To calm the storm, Jonah asked the crew to be put overboard, which the men after much hesitation did. God then sent a big fish to save Jonah. The fish swallowed the prophet, who spent three days and three nights in the animal’s belly before being spit out after a prayer. Christians saw the story – and especially the “three days” part – as foretelling the Resurrection of Christ after three days. The Jonah mosaics are the best part of the floor. 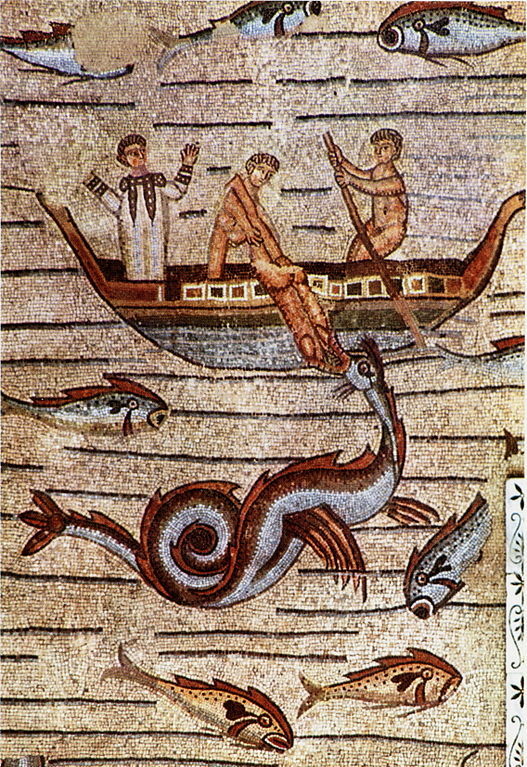 The big fish is depicted as a pistrix, a sea monster that is omnipresent in other Roman mosaics, for instance those in Ostia. Here, we again see Christians borrowing images from Greco-Roman mythology. There are also some frescoes inside the basilica that are worth our attention. The large apse fresco is somewhat faded, but it should still be possible to identify the various figures that are depicted. In the centre, inside a mandorla, are the Madonna and Child. Surrounding the mandorla are the symbols of the four evangelists. The Madonna and Child are flanked by several saints. Interestingly, among these saints we can discern Patriarch Poppo on the left, presenting a model of the basilica to the Madonna. On the right is the German emperor Conrad II (1027-1039). The frescoes in the second crypt – the Cripta degli affreschi – are very nice and should not be missed. As stated above, the crypt itself was built in the ninth century and the frescoes were added some three centuries later. 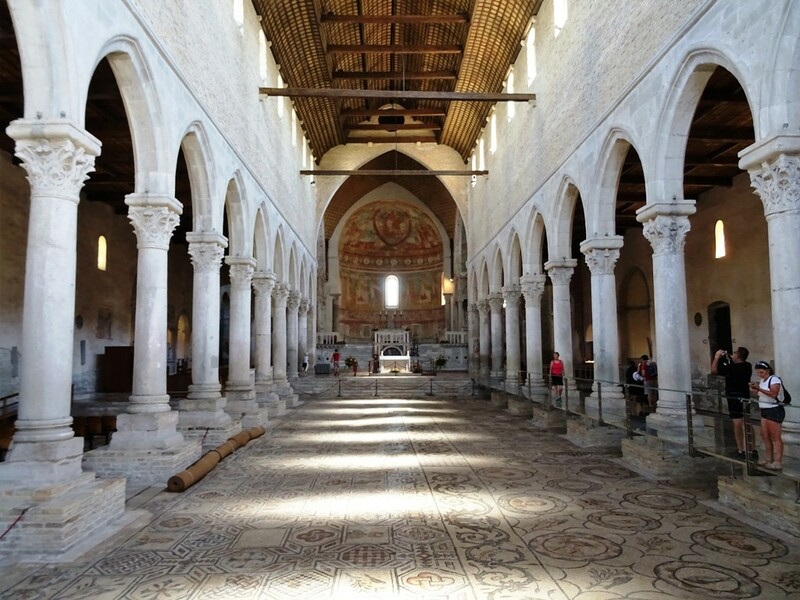 Visitors can admire scenes from the lives of Christ, Mary, Saint Mark and Saint Hermagoras of Aquileia, the legendary first bishop of the city, appointed by the evangelist himself. The most interesting frescoes depict a battle between a Christian knight on horseback, clad in mail and armed with a lance and kite shield, and a horse archer executing the ‘Parthian shot’, perhaps a Turk. This is evidence that the frescoes were painted after the First Crusade. This post is mostly based on information found on the basilica’s website and on this article on Italian Wikipedia. Additional sources are mentioned in the footnotes. From Greek ποίμνιον, “flock”. Not a common word in Latin. See Chapter 10 of Helen Parkins & Christopher Smith (ed. ), Trade, Traders and the Ancient City. Historian John Man (‘Attila. A Barbarian King and the Fall of Rome’, p. 249) seems to believe that the basilica was built over an existing Jewish building. His source is Samuel Kurinsky, a Jewish American businessman who writes ‘fact papers’ about Jewish history. Kurinsky’s claim that “perhaps the main synagogue of Aquileia, lies beneath the grand basilica of Aquileia” is rather unconvincing. The alleged ‘Jewish iconography’ of the floor mosaics is not a very strong argument. The Solomon’s knot – which is omnipresent on the floor – appears in many cultures and is not exclusively Jewish. 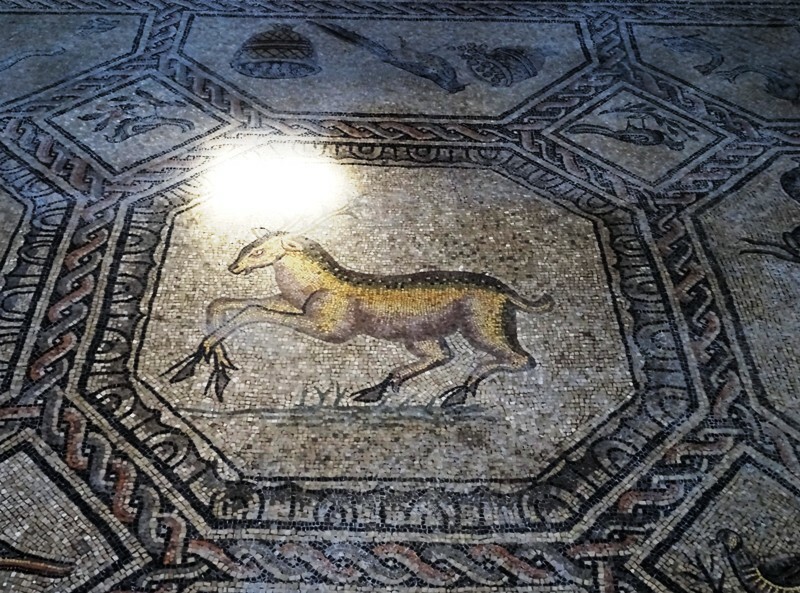 In fact, contrary to what Kurinsky claims, variants of the knot can also be found in the mosaic floors of Aquileia’s secular residential area. 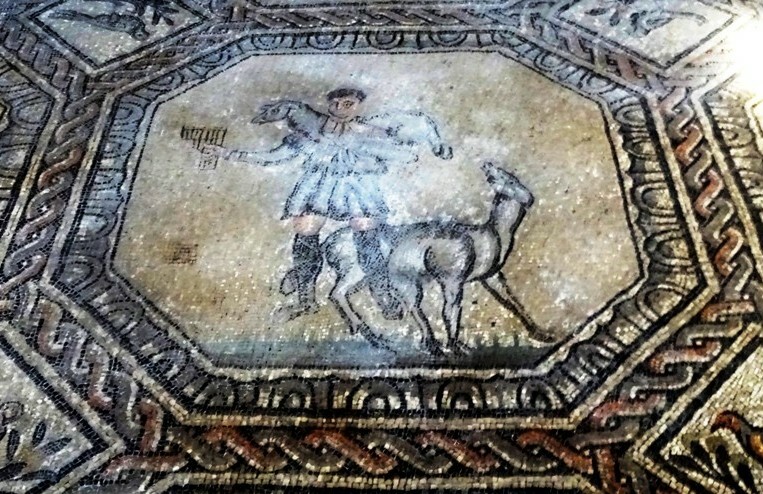 The fact that, inside the church, dozens of images of people and animals are part of the mosaics – which is prohibited in Judaism – certainly does not make Kurinsky’s claim any stronger. In fact, in the first century CE, Jews in Judea were even offended by Roman legionary eagles. It is true, however, that most of the images inside the Santa Maria Assunta are not overtly Christian. Christianity at the time borrowed much of its imagery from paganism. ‘A history of Venice’, p. 62.